The CTL Library area is in the entry area of the CTL. You can browse the books on the shelving or talk with the front desk to view a list of all available books. 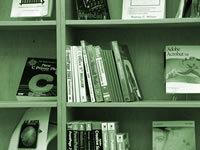 Books can be checked out from the CTL through the front desk staff by filling out the appropriate form.